Let’s state the obvious, I love Thanksgiving, especially the foods associated with this holiday. Just to be clear, I’m talking about the US Thanksgiving holiday on the 4th Thursday of November. In Texas, it’s usually just starting to get cool enough to feel like autumn and really start enjoying the hearty cold-weather foods. Plus, you’ve got the flavors that start showing up in autumn. Pumpkin. Butternut squash. Basically, the whole idea of this blog came about because of Thanksgiving recipes. We went to visit Curt’s family in California and he couldn’t find the recipe for the stuffing that we liked and I got the idea of saving it online. This was way before social media or online storage so I created a personal website on Time Warner Cable’s system where they let you create a little personal site. When they killed that program, I brought it to WordPress. Here is our a list of our favorite Thanksgiving recipes and we do most of them every year. TURKEY – we used to brine and roast the turkey every year. However, last year we bought an electric smoker and we smoked a turkey (OK, 3 of them) last year. We’re going to smoke some more this year. DRESSING – this cornbread dressing is our favorite. In fact, all other normal, traditional ones taste so bland after this cornbread, chorizo, butternut squash recipe. Green bean casserole – this one is best when made with all fresh ingredients. Yes, it OK with canned green beans but it’s so much better with fresh bean like in this Green Bean Casserole. DESSERT – Neither of us are big dessert fans but one of my favorites is pecan pie. However, it’s so sweet, I can only eat a small piece. Curt found a recipe for 1/2 pecan pie and 1/2 pumpkin pie. It’s a great mix of the two pies and kind of the best of both. I’ve never posted that recipe so once I do, I’ll add a link to it here. The whole point of this post is that I hope everyone who reads this has a great Thanksgiving with great food, but more importantly, with great family and friends to share it with. The best part of spending so much time in the kitchen making great food is sharing it with people who are important to you. Here is our recipe for green bean casserole. It’s the first one we made from scratch with fresh green beans, as opposed to using can beans. It’s really not that hard and the FRESH home-made fried onions are awesome. I got this from a magazine years ago but we’ve adapted it a lot over the years. Please make them and don’t use the canned onions. I know it takes more work but your tongue will totally thank you! 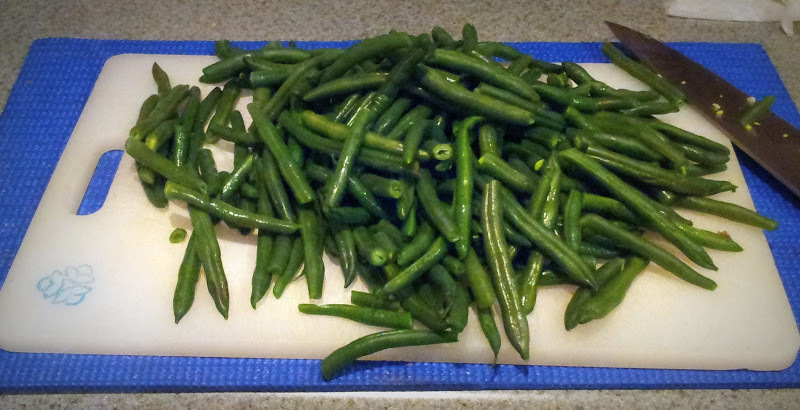 Cook the green beans in a large pot of boiling salted water for 3 minutes or until crisp and tender. Transfer to a bowl of ice water with a slotted spoon. 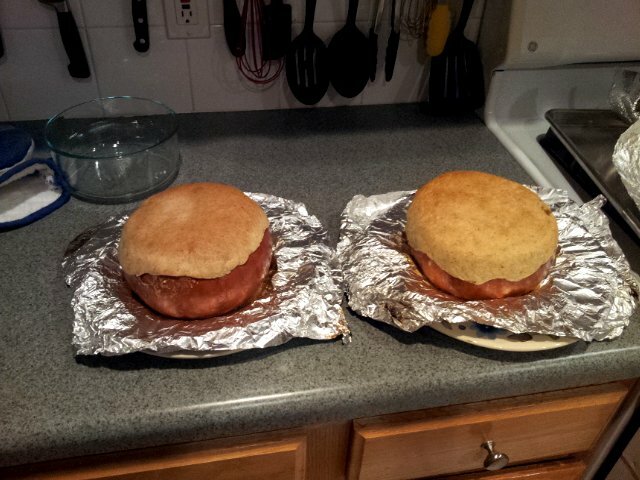 Let them cool completely and then drain on paper towels. This helps them stay bright green and crisp. For the fried onions: Heat 2 inches of the oil in a large deep skillet to 375 degrees. Working in small batches, dust the onion rings with the flour, shaking off the excess, and fry them for 1 to 2 minutes or until light golden. Transfer the onions after they are browned to paper towels to drain. Repeat the procedure with the remaining onions and flour. For the main casserole: Preheat the oven to 350 degrees. Melt 3 tablespoons of the butter in a large skillet over medium-low heat. Add the shallots and the garlic and cook for 2 minutes. Turn the heat up to medium, add the remaining tablespoon of butter, all the mushrooms and thyme, and cook, stirring occasionally, until all the liquid the mushrooms give off is evaporated. Sprinkle the flour on top of the mushrooms and cook the mixture, stirring for 1 minute. Add the milk in a stream, whisking, bring the mixture to a boil, and simmer for 3 minutes. stir in the green beans and half the cheese and season with salt and pepper to taste. Transfer the mixture to a 2 quart casserole dish. Top with the remaining cheese and fried onions and bake until hot and bubbling (about 20 to 25 minutes). Here they are right out of the oven. I let them sit for about 10 minutes and then they are ready to eat. Many years ago we saw Martha Stewart make this on FoodTV. Ever since then, we make this every year during the fall. Sometimes we make it more than once because we usually have extra filling so later we just have to fill the pumpkins. I love the flavors of fall and this one is a great exhibition of the best of fall produce. We usually use homemade chicken stock in this but you can also use canned stock. Also, the original recipe calls for a pate brisee dough for the covering. We’ve always used frozen pie crust but this year we actually made the pate brisee. It was really easy and turned out great. Recipes with flour always freak me out so I have always avoided them but you really shouldn’t be afraid to make this simple dough. 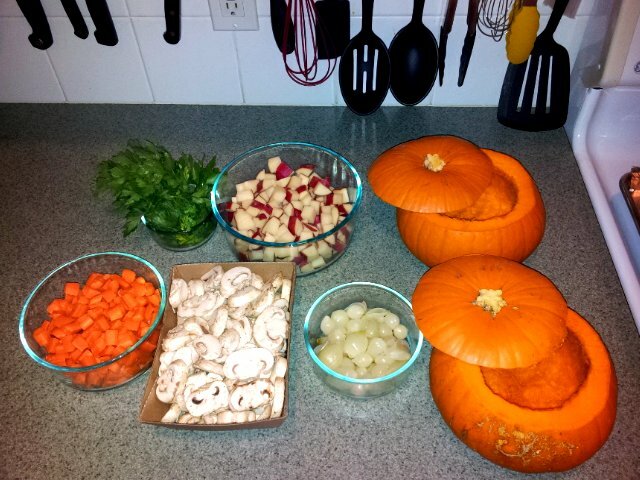 This recipe is for 6 smallish pumpkins but we usually use 2 medium sized sweet pumpkins. This gives us enough left over to have it at least one more time. The left over filling can easily be stored in the freezer until you’re ready to use it. Here are most of the ingredients that I was getting ready. Preheat your oven to 375 degrees F. While it’s heating, slice the tops off the pumpkins. (Placing a pumpkin on a towel will help keep it from rolling around.) Scoop out the seeds, and save them, they are great after you toast them! Using a pastry brush, brush insides of pumpkins with 2 tablespoons melted butter. 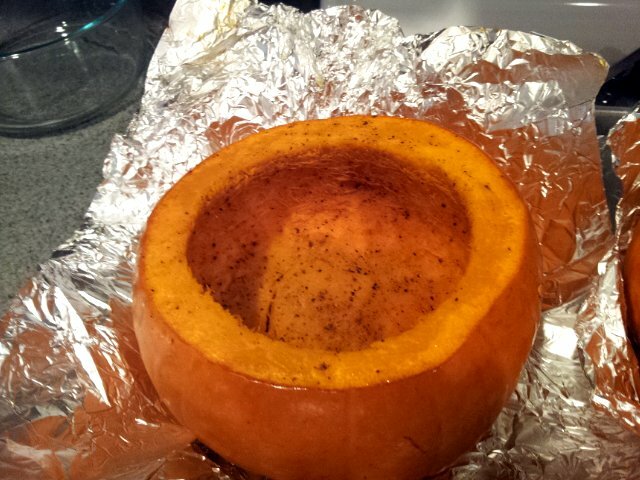 Season insides of pumpkins with 1/2 teaspoon salt, 1/4 teaspoon pepper, and 1/4 teaspoon nutmeg. Place pumpkins on a baking sheet; cover tightly with foil. Bake until tender, about 30 minutes. This pumpkin is ready to be filled. It has already been seasoned and gone through the initial coking. Prep the pearl onions: my first word of advice is not to worry about peeling them until after you prep them. Bring a medium saucepan of water to boil. Add pearl onions, and let simmer for 15 minutes. Drain; rinse under cold running water. Once you’ve let them cool down, the skin on the onion should come right off with no effort. Set the onions aside. Melt 5 tablespoons butter in a large, high-sided skillet set over medium heat. Add potatoes and onions, and cook, stirring occasionally, until the potatoes begin to turn golden. Add mushrooms and carrots, and cook 4 to 5 minutes more. Add flour, and cook, stirring, for 1 minute. Add reduced chicken stock and milk, and bring to a simmer. Cook until thick and bubbly, stirring constantly, 2 to 3 minutes. Stir in chicken, thyme, parsley, sage, remaining 1 1/2 teaspoons salt, 3/4 teaspoon grated nutmeg, and 3/4 teaspoon pepper. Remove from heat, and divide mixture among reserved pumpkin shells. Roll each piece of pate brisee to an 1/8-inch thickness. Pull center of dough upward to form a pumpkin like stem. Place over the hollow of each filled pumpkin. Using the back of a small paring knife, mark the dough to simulate the lines of the pumpkin. Brush top of dough with egg wash. Bake until crust is golden, about 45 minutes.